Ever fancied a phone that you could wrap around your wrist, or build into your clothes? At IFA 2018, Chinese company Royole has shown off its range of fully-flexible displays, including panels built into a ski jacket – and a top hat. A bendy screen is just one of the components necessary to make a foldable phone or smart coat, and Royole also makes a range of flexible sensors, circuits and other electronic systems to make these products possible. 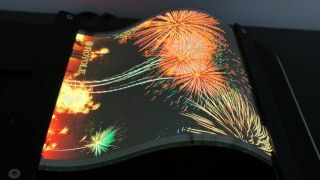 “While curved displays have been the talk of the tech world this summer, Royole has developed and is now mass-producing the next generation of fully flexible displays,” said Dr Bill Liu, founder and CEO of Royole. "Our engineers are currently working with over 220 partners worldwide to change the way people interact with technology in their personal environments." Royole might not be a household name outside China, but with flexible devices like Samsung's long-awaited foldable phone on the horizon, its tech could soon be in high demand. How far are we from the perfect smartphone?